How to activate nuts and seeds - Nutmad, activated nuts free shipped to the UK! If you’re looking for a way to boost your balanced diet and are seeking a new healthy food to eat, then look no further than activated nuts! There are a wide variety of nuts available in all different shapes and sizes. The following nuts offer us a wide range of nutrients and health benefits. Almonds are calcium rich and help protect and maintain your bones. They are also high in antioxidant vitamin E, which is great news for your skin. Cashews have a high level of protein and have a handful of important minerals including zinc, iron and magnesium which can help delay age-related memory loss. Walnuts are a great source of mono-unsaturated fats which plays a role in lowering bad levels of cholesterol. They are also very rich in omega -3 and can help reduce depression. Hazelnuts are rich in magnesium and Vitamin B and E. They are a great aid to your heart and can help reduce the risk of cancer. Pecans are rich in antioxidants and great for lowering cholesterol. They are packed full of vitamin B3 which can help boost energy. Bursting full of good stuff! As you can see, the health benefits of nuts are so many! They’re packed with beneficial minerals, fibre, protein and essential fats (that’s the good kind of fat). This is very beneficial for your health, especially if you consume them as part of a balanced diet. Nuts work great as a healthy snack as they can be quite filling, due to their fibre and fat content. This is perfect for dieters who are looking for a way to lose a bit of weight, as they help keep hunger at bay. They can also help those who are trying to gain weight. As a great source of protein and healthy fats and with good portion control, can be a great accompaniment to meals. 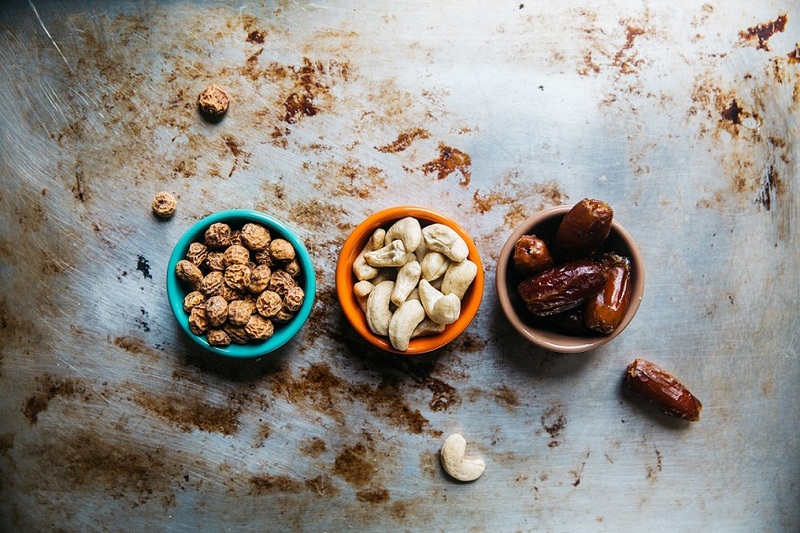 Although nuts and seeds are a fantastic healthy food to eat, they contain antinutrients, natural chemicals called phytic acid and enzyme inhibitors, that stop the body from absorbing all these great nutrients fully (going against the whole point of eating nuts as a healthy food in the first place). Also, they can be quite rough on our digestive system. Consuming large amounts of raw nuts may lead to the feeling of heaviness, bloating, nausea and other uncomfortable digestive issues. How to solve the problem with nuts and digestion? The answer is activated nuts! To activate nuts, you need to soak them in salty water and then dehydrate them at a low temperature. The process of soaking nuts helps to remove the phytic acid and breaks down the enzyme inhibitors. To get back their crunchiness, and to preserve their nutrients, you need to dehydrate them again at low temperatures, ideally until they are completely dry. After activating, the nourishing substances are more available to the body and you can easily digest the nuts. Each type of nuts has different soaking and drying times. At Nutmad, we use this process to deliver the best quality nuts and take the process of activating nuts out of your hands, so you spend more time enjoying them. Nutmad’s activated nuts are high in protein, essential fats, dietary fibre, antioxidants and minerals and most importantly they are yummy. So, in a nutshell, if you are looking for a healthy food for your balanced diet, activated nuts are your best friend. Are there any other foods that need to be activated? The same antinutrients are present also in seeds and legumes. If you like topping your salads with pumpkin or sunflower seeds, or if you use them for baking and cooking, you can leave them to soak overnight in filtered water first, rinse them well, and then let them dry on a tray in the oven at low temperatures (under 100 degrees C) for a few hours. For a salad, you’d probably like to have them crunchier than for a bread or cake. When you soak kidney-shaped beans, add some baking soda to the water. Use a large bowl and make sure you cover well with water since the beans can expand a bit while soaking. There is no need to dehydrate the legumes, they are ready to cook as usual straight after soaking.